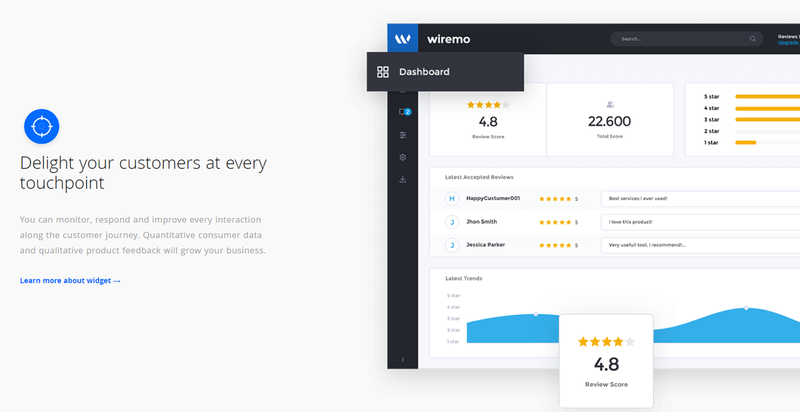 Using Wiremo Dashboard you can easily monitor, respond and improve every interaction along the customer journey. Below you will find the most important features of the Wiremo Dashboard, and how you can use them. 1. Review Score (pin 1) - The average of all your scores, from the reviews you have accepted. 2. Total score (pin 2) - Total number of accepted reviews. 3. Start statistics (pin 3) - Here you can see, in percents, star trends. 4. Administrator menu (pin 4) - by clicking on your name you will see your main menu with the most important link - Your account setting, Billing details, Access to support page and of course Log Out. 5. Latest Accepted Reviews (pin 5) - In this block are listed latest reviews that you have accepted with ratings and the reviews text. 6. Sort Latest Accepted Reviews (pin 6) - You can sort your latest reviews by stars. Just click on "All" and choose the number of stat for filtering. 7. Customer Reviews menu (pin 7) - by clicking on the customer reviews menu you can easily Start a conversation with your client, or change current status of the review, from Accepted to Pending or Declined. 8. Review Trends - In this block is presented the chart of all your accepted reviews. You set it up see your trends by day, week or year. By clicking on days, week or year point (pin 8) you will see a pop-up with a short report about the average rating of the reviews for the selected period.